I am pleased with my first yarn and very happy to meet Sue and Bill. I am sure that we will keep in touch in the future. 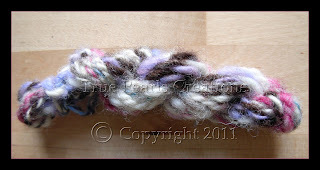 Pleased to refer their online shop which has a lot of exciting features regarding spinning, weaving and dyeing. We have bought my first spinning wheel an Ashford Kiwi, a big box of fleeces, and I am hoping to make lot of nice yarn in the future with it.